GLOGIRLY: On the Road With Waffles & Katie: Do You Smell Something? 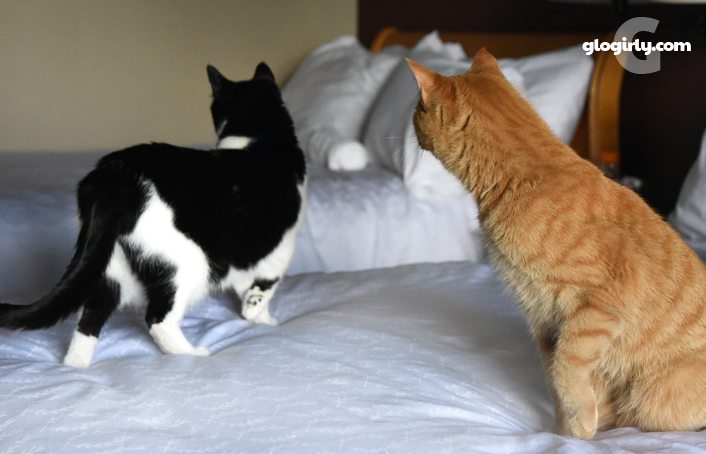 On the Road With Waffles & Katie: Do You Smell Something? WAFFLES: Hey Boss? Is that... uh... is that Ceiling Cat??? KATIE: No Waffles, there's a DOG in the room above us. WAFFLES: Sounds more like an elephant. WAFFLES: Do you think he's coming to our party tonight? KATIE: Well, did you invite him? WAFFLES: Glogirly said everyone is invited. Does that mean the dogs and the elephants too? KATIE: Someone's at the door! WAFFLES: The dogs and the elephants??? KATIE: No, something smells really good. I think it's room service. Do you smell it? WAFFLES: Yeah, Boss. I smell it! Today was the first official day of the BlogPaws conference. 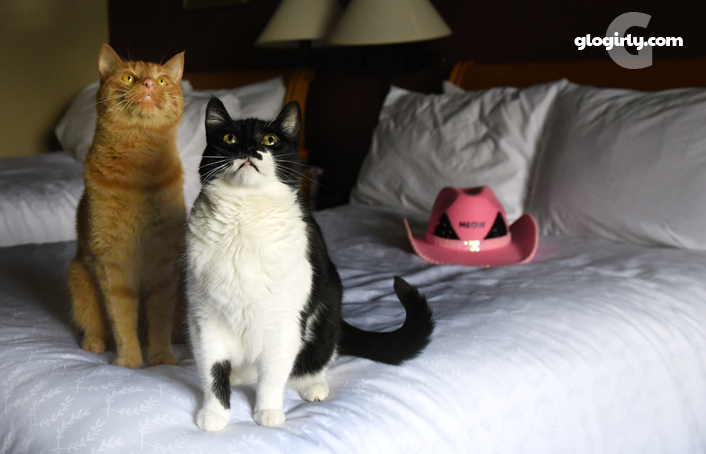 While Glogirly was off schmoozing with pet food brands and scoring free samples, Katie and Waffles enjoyed some R&R back in the hotel room. Preparations have begun for our exclusive Kitty Cocktail Hour we're hosting tonight. 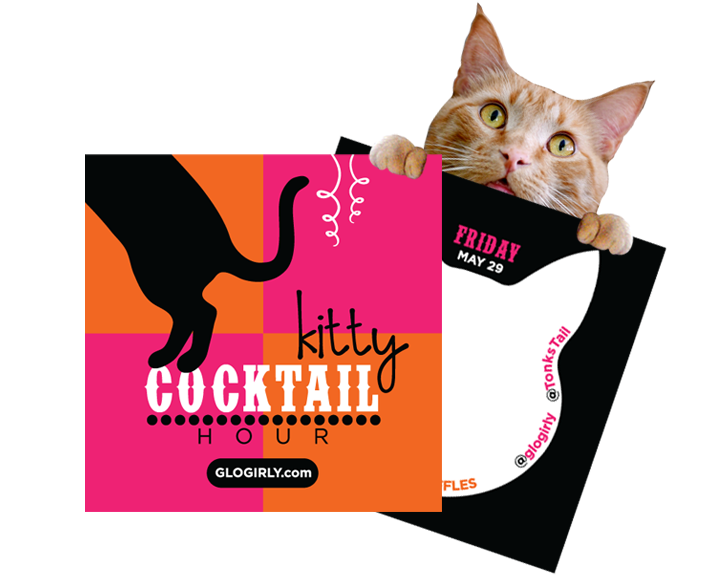 Cat Ladies, Cat Men and even a few dog aficionados will be descending on our hotel room to get a glimpse of the celebrity cats and enjoy Glogirly's secret-recipe Kitty Cocktails. Katie and Waffles will be sporting some serious bling in their rhinestone studded harnesses and the paparazzi will be on the scene, cameras at the ready. We'll be sure to share ALL the highlights with you! ... and even Glogirly's secret recipe. Poor Summer! I thought you and Waffles might become an item! OMC, where are ya'll hiding.? Haven't seen hide nor hair of you or the posse. Y'all have a great party! Watch out fur the dogs & elephants! Oh how exciting. We can't wait to meet everyone. I can't wait to meet you Katie! We are so enjoying your keeping us posted on what is going on! Mom wishes so badly she could be there! 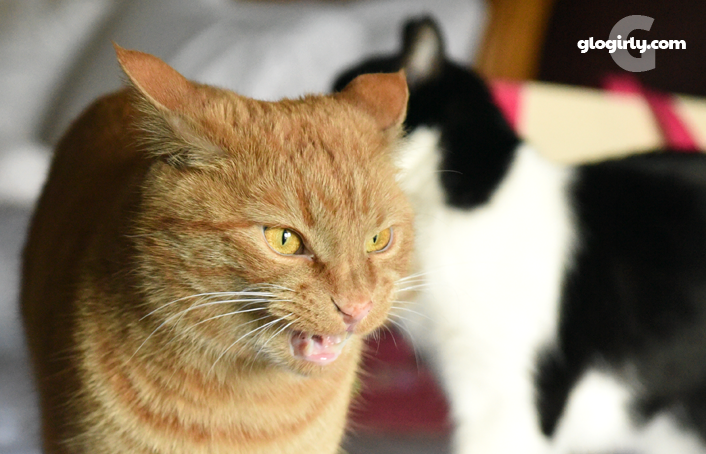 Z-Girl is so upset that she can't be in Nashville at the conference, to learn and to see all the latest cat swag. But above all, she really wanted to meet Waffles and Katie, nose to nose. So, we ask that someone raise a glass for the Squeedunk Gang at the Kitty Cocktail party tonight! Have a wonderful time! We love ALL of our blogging buddies. Cheers! I wish we could stream your cocktail party online! Mom Paula can't wait to see you tonight. Meowm was beside herself waiting for this update last night! She finally forced herself to go to bed as she knows how late some of the evenings can be in Blogpawsland. We all can't wait to see pictures from tonight! Just love the first photo and we can't wait to see the elephants! I cannot WAIT to see all of the pictures!!! Have a blast! Sorry I will miss it! Very sorry to miss your party! I am regretting not going to BlogPaws. I especially wanted to meet Katie, since I briefly met Waffles last year. Enjoy the pawty Katie and Waffles! It sounds like you are going to have a lot of fun. Mommy is WEEPING with envy. Too bad there's not a LiveStream of your party, Katie and Waffles! Hope the part-ay was a good one. Mum wishes she could be there to meet all the gang. Two and four footed. I'm reading about your trip today! Finally! I scanned through each day but didn't comment. Sorry. I'm so glad you are back home safe and sound and you had a great trip. Love you lots!